Richard Thorncroft (Julian Barratt) is Mindhorn… or rather he was Mindhorn, back in the 80s. Armed with a robotic eye that allowed him to “literally see truth”, Detective Bruce P. Mindhorn was the Isle of Man’s answer to Bergerac; a treasured TV sleuth with dapper looks and a seductive charm. The ladies loved him, his co-stars envied him, and audiences adored him. Fast-forward 25 years, however, and Thorncroft’s career is in a critical condition. Overcome by his own pompous arrogance, Thorncroft left the show and headed to Hollywood in search of a better life, insulting a number of his fellow cast members in the process. He only made it as far as London though, where he now resides in a dingy studio flat. Of late, his only notable role was as the star of an advert for orthopaedic socks, and he even ended up loosing that to John Nettles. 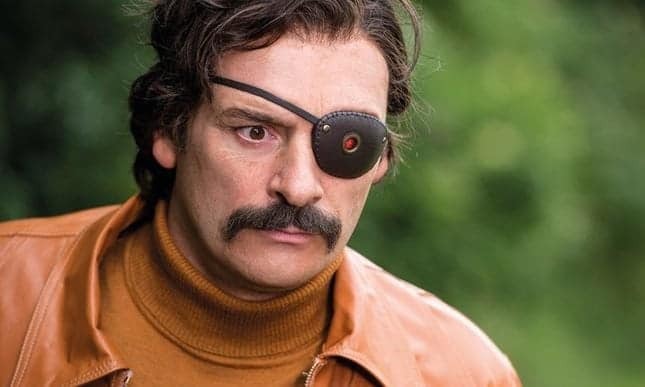 Opportunity strikes though to revive his flat-lining reputation when a deluded criminal (Russell Tovey) calling himself “The Kestrel” begins terrorising the Isle of Man and, believing the character to be real, insists on speaking only to Detective Mindhorn. First-time filmmaker Sean Foley, working from a script that’s co-written by Mighty Boosh veterans Julien Barratt & Simon Farnaby, may pitch Mindhorn somewhere between Hot Fuzz and Alan Partridge: Alpha Papa – Barratt’s boorishly narcissistic but blissfully amusing rendering of Thorncroft sharing a clear symmetry with Steve Coogan’s iconic yet inept disc jockey. But by contrast, this fun & free-spirited pastiche only ever succeeds as a fitfully diverting pleasure; one that frequently finds itself so distracted by its own conceited ego that it evidently forgets that it has an audience to entertain. Much like Thorncroft himself, Mindhorn carries an overwhelming air of self-importance. The plot is pacey – despite conspicuously lacking an antagonist that poses any sort of threat – and laden with both outlandishly raucous one-liners & offbeat set-pieces that make a pronounced use of the singular location, yet the film regularly appears to be unnecessarily consumed by its own attempts to lampoon the home-gown detective shows that ‘Mindhorn’ is parodying – fuelling, most problematically, a tactless thread of misogyny that, amongst other things, effectively lays waste to Essie Davis’ spunky performance as Patricia, Richard’s former love interest. What’s truly troubling is that the script never has enough smarts for you to believe that it’s aware of such shortcomings; apparently more interested in shoehorning in a surprising number of novelty cameos. But moreover, and herein lies the real rub, one suspects that it is also too self-absorbed to even care. Mindhorn is in cinemas from Friday 5th May.